This spring five students will embark on a new opportunity, a directed study geared toward equipping them with skills quite different, but yet complimentary, to those they learn in the Exercise Physiology program at UMass Lowell. The five students have agreed to participate in two semesters (a full academic year) of directed study. In the first semester they will learn about data analysis with hands on programming using the R statistical programming language (www.r-project.org). Despite the steep learning curve of using R, it is popular, powerful, open source and free! So students will be able to use the skills they obtain anywhere they end up going – not bound by expensive licenses to use the tools. If they decide to, they could get so advanced with R that they can develop their own customized R packages to for obtaining data, cleaning data for analysis, or running analyses in whatever area of exercise physiology they pursue. During the second semester they will complete a data analysis project using open source data from a variety of possible sources (part of this semester’s exercise the students will seek out and build a list of links to open source data for their projects next semester). 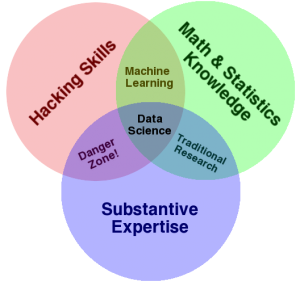 Data science (analysis) skills are highly sought after (see here, and here, and here), and there is an increasing demand for people with cross disciplinary skills. 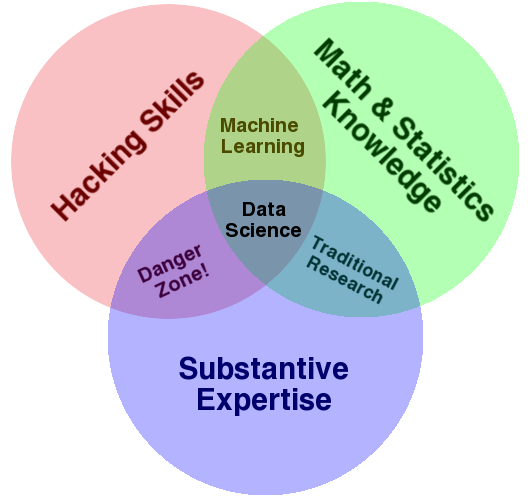 With mobile technologies allowing measurement of so many health, fitness and performance metrics there is a data revolution creating a need for people who understand health, fitness and performance metrics (such as exercise physiology) to also know how to analyze and generate knowledge using the data (such as hacking skills and statistics. Companies such as Garmin, Nike, MapMyFitness (owned by Underarmor), Zephyr, Polar, Wahoo…. are all competing not only for the hardware systems to measure important metrics, for the analysts that can help develop the proper tools for going from data to understanding to action. The Exercise Physiology program provides the “substantiative expertise”, the core curriculum requirements provides an introduction quantitative reasoning and statistics; this directed study will build on those foundations and further develop the statistics skills while adding the hacking (computer programming, self directed problem solver) skills. Source: Drew Conway, Sept 2010. Reproduced under a Creative Commons License. During this semester I will regularly update the blog to keep anyone interested up to date with our progress. Also, if you have a data analysis project in mind, something you could use help with – send me an email and let me know (see the About page). Why should an exercise physiologist learn to do data analysis?